We visited Kaua’i for the first time this month. As usual, we spent part of our time visiting waterfalls. We rode one of the helicopters that gave us a tour of the entire island. 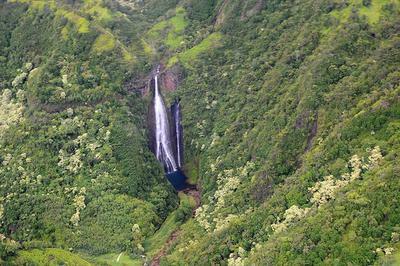 While flying over Manawaiopuna Falls we noticed a helicopter taking off from a helipad near the base of the falls. This is a regular commercial tour that I might want to take next time we visit. In the valley above Manawaiopuna Falls there are seven separate falls converging in the same valley. I don’t know their names.